Pricing your freelance services isn’t just about the money you want to make, it’s about the quality of life you want for yourself and/or your team. 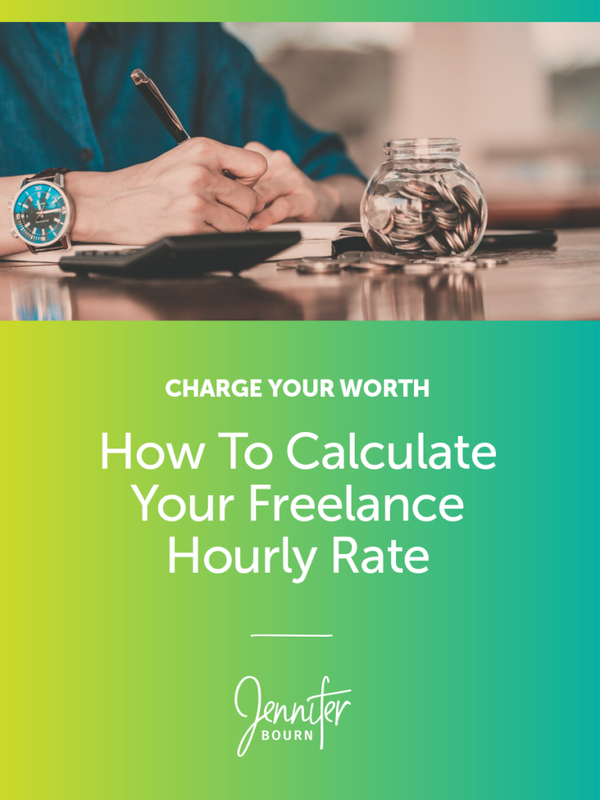 Whether you use hourly pricing, flat-rate pricing, or value-based pricing for your freelance services, to calculate the total price for a specific scope of work, you need to know your minimum hourly rate. But where do you start, what do you need to consider when setting your pricing, and how do you calculate an effective hourly rate? The math makes sense, but the thinking behind it is all wrong. If your goal is to make $100,000 per year and you only charge $50/hour, you’ll soon find yourself in a lot of trouble. Even if you marked it up an extra 20% to cover expenses, making your rate roughly $60/hour, you’d still run into financial problems. This miscalculation is why we see so many online experts claiming to have made six figures, yet only actually earning an income of $65,000 and struggling to make ends meet in secret. Hitting $100,000 in total earned income (gross) is quite a bit different than keeping $100,000 in personal income (net) after paying all of your expenses. Pricing your services isn’t just about the money you want to make, it’s about the quality of life you want for yourself and/or your team. When setting a freelance hourly rate you need to think about total annual company earnings (gross) and total annual income (net), as well as total company profit. How many hours are worked each week? How many billable hours are expected each week? Remember, not every hour “at work” will be a billable hour. What about vacation time and holidays? Will there be business travel? And, look at your desired freelance profit margin. Salary is not profit, it’s a business expense. Profit is what is left over after the salary has been paid — it is the money available to you to reinvest in and grow your freelance business. Using the desired income of $100,000 and full time 40 hour/week employment as the example, let’s look at how to calculate a freelance hourly rate that covers your expenses, creates profit, and supports the quality of life you want. Add up all of your expenses: including website hosting, software subscriptions and fees, internet, telephone, rent, utilities, office equipment, computers, furniture, office supplies, professional tools, professional memberships, certifications, travel expenses, advertising and marketing costs, legal and accounting fees, vehicle mileage, taxes, workers comp, salary, insurance/benefits, business cards and stationery. If you’re new to freelancing, business ownership, or agency ownership and you don’t know what some of the expenses are going to be yet, reach out to industry contacts and ask for ballpark figures for planning purposes. As I mentioned, you also need to calculate the profit margin you want to see in your freelance business. A common profit margin for client services is 10-20%. For this example, we’ll play it safe with a 10% profit margin. I’m pretty sure you’re not a robot, which means you won’t be billing 40 hours per week for all 52 weeks of the year. You’ll not only need to take breaks, eat lunch, respond to email, participate in phone calls, attend meetings, and take care of administrative tasks, you’ll also need to take sick days, vacation, and holidays. The total number of holidays, vacation days, sick days, and business travel days equal 37 days or 296 hours. If you take a one hour lunch and spend only 90 minutes on administrative work, phone calls, email, and meetings each day, that means you’re working 5.5 billable hours a day or 27.5 billable hours each week. So, instead of working 2,080 hours each year, you’re only working 1,134 hours each year. As you can see the minimum hourly rate needed to achieve a freelance income of $100,000 in this example is almost triple the original calculation of $50 per hour. The problem with the first approach to setting an hourly rate is that it failed to account for all of the expenses, days not worked, and profits. When figuring out how to price your freelance services and set an effective hourly rate, it’s important that you not operate in a vacuum or isolate yourself from what is happening in your industry both locally and globally. You need to do some investigative work to uncover the rates competitors are charging and what other service providers are charging for similar work with similar clients. This will help ensure your hourly rate is based on reality and in alignment with what your potential clients are willing to pay. No one who has started a business, whether they’re freelancing or running an agency, did so to work for free, be underpaid, and exist as a slave to their business. You deserve to earn a fair fee for a job well done and to charge your worth and get it, and as long you price your services appropriately — taking expenses, profits, and quality of life into account — you’ll be able to do just that.